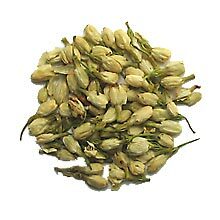 Regarded and adored by the Chinese as the "world's best fragrance", fresh Jasmine flowers are often used to scent and add flavor to Green teas. It has been recorded that the Imperial Court of Song Dynasty used fresh jasmine flowers to perfume the emperor's bedchamber. The lovely fragrance is known to have a calmative effects that soothe the nerves, while the liquor is refreshing and has a cooling effect on the body. Small, yellowish white jasmine bud.